Superman, shirtless, experiments with Mr. Terrific, Dr. Light (Kimiyo), and Ray to restore his powers. It appears that his cells are no longer taking in sunlight, they're actively resisting the input. Waking up, Clark Kent feels as if something is changing, or wrong. He realizes it's not Lois, not work, not home. But it's something. With Jimmy, he finds the evidence he's been seeking of Intergang using the decimation from (presumably) Infinite Crisis to gain finance through no-bid gangster contracts. They happen upon one of these meetings, snapping pictures. The Intergang men see them and raise their weapons. Clark tells them it's a waste of time, he's already transmitted pictures via a wireless link to the Daily Planet. He asks the councilman present for comment as the police arrive. Jimmy asks Clark to hang out in the park, and Clark agrees. Writing up the story, Clark wonders why someone would want kryptonite with Superman gone. As he's trying to figure it out, Lois appears, asking Clark why he's not cold, when the air conditioner is stuck on high. Clark loses his story through a computer glitch. Perry appears, about to blow his stack, but forgives him, as he's delivering great headlines. He leaves, whistling. The staff applauds Clark, astonished to see Perry happy. Clark wonders what Luthor is up to, all the same. Luthor, meanwhile, has the Kryptonite Man strapped into a kryptonite cannon, feeding the energy into a giant crystal he calls the Sun Stone. Toyman observes as Luthor explains that he's using Kyptonite Man to focus the energy of virtually ALL the kryptonite left in the world into a giant cannon. Clark, meanwhile, watches a monster truck rally with Lois. Seeing how bored Clark is, Lois lets him leave, offering to meet up with him later for dinner. Clark leaves to find DVD box sets of old TV shows he's missed watching. As he exits, a ray of light hits the ground. Radion, a giant, green villain and a man in a yellow armored suit (known to you all as NEUTRON, the LIVING BOMB! WOOO! Sorry. Stepped out of neutrality there...Neal) tell Clark they're there to settle up for Intergang. Jimmy, meanwhile, awaits Clark's call, lonely. Clark dodges debris, running and trying to call Supergirl. The watch and his cell phone are on the fritz. Neutron tells Radion to take it easy, Intergang wants him to suffer, losing one layer of skin at a time. Luthor, meanwhile, reveals to the Toyman that he's found what he's searching for, a ship that crashed in 1938, from Krypton. The cannon he's created has made contact with it, finally, and it's now headed for Luthor. Clark, meanwhile, just misses getting hit by a volley. He's sure he hasn't been hit, otherwise the volley would have torn his arm off. As it is, his coat is burning. He gets up, continuing to run. 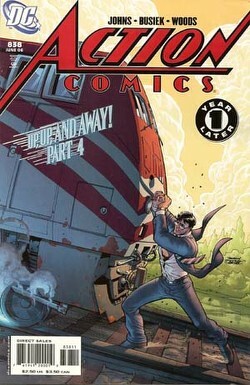 He heads for a train tunnel, trying to protect the people from the villains, only to see a train coming. Radion hits the tracks, knocking Kent down. The train bears down, hitting him full-bore. The villains, seeing Clark to be dead, leave. Clark stands up, unharmed, and finds his handprint in the train. Story - 5: I like how Geoff and Kurt take things that have been done before, and make them new again. Face it. Every Superman plot has pretty much been done, twice. It's all a matter of how you make them resonate. Some do it with iconic imagery and plotting. Others focus on what makes the character great and torque it. This story does that. First off, an apology to Kurt, because last issue I focused the credit for this story solely on Geoff. I didn't note the other credit until after the fact, so all of my compliments go the same for Kurt. Superman's lost his powers before. He's been normal for a while. Lex has found some new Kryptonian threat to attack Superman with in varying ways over the years. What sets this apart is the simple attention paid to the fact that Superman is a book about a guy with incredible powers, but the best tales of his work are the ones where you realize what makes him what he is, from how he acts to the people around him. Lois, not a "bich?" I must be dreaming. Clark goes out with Lois, Lois sees that he hates monster trucks and she...she...she lets him go do something else without protest? Holy cow. Austen would have her stab Clark in the eye. I very much like this Lois. Supportive, not submissive, but nonetheless a great yang for Clark. Perry, fully in character. Time was we wouldn't even SEE Perry. Or realize that Clark's a reporter. That's gone in this story. This story is a counter-example, and iconic. Jimmy actually doing more than being set dressing? Check. Mention of Ron and Lucy? What's going on here? I thought Rucka's attention to these details would be a flash in the pan, but Idelson and Busiek and Johns say, Uh-uh, girlfriend! Or, you know, something like that. NEUTRON. Neutron, and maybe they know this, likely they don't, but anyway, Neutron is my favorite villain as a kid. Not for any real reason, but just because I liked the idea of a living bomb. He was also one of the first Superman villains I saw, and his comic brought me from the realm of dime issue stories that ended before the comic did and brought me to the realm of having a comic where the story would continue, next week, and escalate. Neutron's probably why I still buy comics, in some weird way. I love to see him. Luthor's mysterious ship is kind of crazy, too. An original, awesome idea. I have one major beef, but it's not the fault of Idelson, Busiek, or Johns. There is no way it could have happened in current excepted continuity. Thank Birthright. Read it, and you will see that in the quote unquote "OFFICIAL ORIGIN" of Superman, Krypton is alone in the universe and thusly has no ability for space travel before Jor-El's experimental rocket, so thusly no ship before Clark's. I bring this up because it's one of Birthright's most glaring errors, given that it makes Doomsday's origin impossible as well. I'm a bit, I don't know, confused by one character choice. Clark, thinking to himself, says that he's pissed off Intergang. I always walk a fine line with cursing in Supes and comics in general, because frankly, I don't care. I just know that iconic characters that are supposed to be things kids can read doing things that adults might start another witch hunt over is something to examine. That said, I don't object for that reason, I just bring that up. I object because that's not how Clark thinks, in character. It takes Superboy getting killed for him to say, "Like hell." in Infinite Crisis. He's, through and through, a boy scout. Cursing is beyond him, even if it's not for me. LOVE the movie reference. Luthor tells Toyman "It's no fairy tale." That's a line from the beginning of Superman: The Movie, those three of you who haven't seen it. Neat reversal. The metas see Clark die. He takes a train, and crumples it. This is kind of a pat, Smallville style scene. They were paid to kill Kent. When he's still alive, aren't they gonna wonder how he survived that hit? They might not know he's Supes, but they'll know he's a meta, and with how much Intergang hates Kent, they'd exploit that. Art - 4: I very much like this work. The character in the faces is what gets me the most. There's less detail in the faces, but there's an awful lot of who each individual is, particularly Luthor. I don't particularly think it's the best Neutron, but I think it's a great Clark. Jimmy has freckles. Thank monkeys that phase of no-freckle-Jimmy is over. Biggest Crisis since long-haired Supes. I kid. The one thing that did bug me was the way the coloring was a bit bright. Often, coloring is too bright or too dark. I don't mean bright in the vivid colors sense, more just like the contrast was turned way down, as if everything was in the sun. A little bit of Tide, make it bolder. Still, consistent, at very least. Cover Art - 5: Iconic, a reversal, eye-catching, and awesome. It happens in the story, albeit with a costume change, and it's just really, really cool to see the scope of Superman's powers through our window to his ordinary human-ness. Kind of like seeing Clark fight Superman in Superman III. You know he has the same powers, but Clark... he's ineffective. To see him display power is a neat, unexpected change.